In ancient times, influenced by writings of Aristotle and Ptolemy, the earth was considered to be the center of the universe for nearly 1500 years until Nicolai Copernicus published his heliocentric model of the universe in De revolutionibus orbium coelestium (On the Revolutions of the Heavenly Spheres) in 1543. Nephrologists, often considered some of the smarter practitioners and teachers in medical centers, regard their organ of choice, the kidney, as highly complex and important and as a master mediator over several systemic processes. Over the past 15–20 years, there has been an explosion of research in experimental animals and epidemiology related to AKI not only as an outcome in hospitalized patients but as a primary exposure of interest and perhaps, a “cause” itself for several untoward short- and long-term outcomes (Ptolemaic Viewpoint in Figure 1). Opposing views of the role of the kidneys in relation to dysfunction of other organs in the body. In the Ptolemaic viewpoint, the kidneys are seen as a key “driver” of dysfunction of other organs, including the heart, lungs, vasculature, etc. In this viewpoint, AKI can directly contribute to heart failure. In contrast, the Copernican viewpoint holds these key organs in the center and the kidneys as an orbiting planet. In this paradigm, dysfunction of heart, lungs, vasculature, liver, etc. result in kidney injury and/or reductions in glomerular filtration rate. Exogenous factors, such as nephrotoxins, can also injury the kidney. 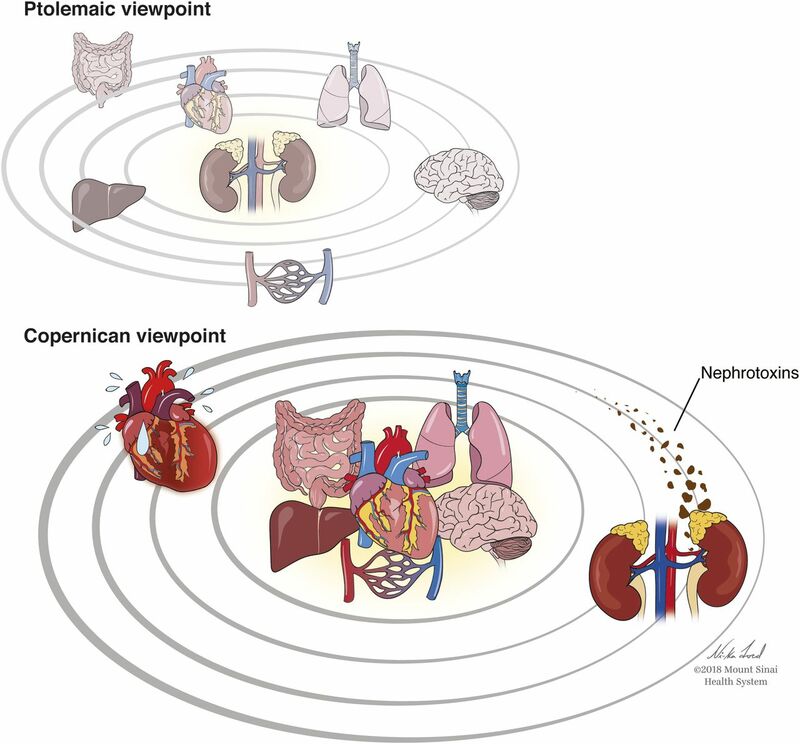 In the Copernican viewpoint, AKI and heart failure often co-exist as they “travel in the similar/parallel orbits,” yet the true origin of heart failure and AKI was due to initial insults from the centric organs. In this issue of the Clinical Journal of the American Society of Nephrology, Go et al. (1) have examined the risk for heart failure and cardiovascular (CV) events after an episode of AKI. This was a strong and meticulous analysis that leveraged the Kaiser Permanente Northern California population. Using a propensity-matched cohort design, the investigators examined the association of AKI with the risk for CV events in the first year after discharge in 146,931 hospitalized adults. Although the association between AKI and atherosclerotic events was not statistically significant, the adjusted hazard ratio for subsequent heart failure was 1.44 (95% confidence interval, 1.33 to 1.56) after adjusting for demographics, comorbidities, procedures, laboratory variables, length of intensive care unit (ICU) stay in the ICU/hospital, and predicted mortality score. The amount and degree of adjustment for potential confounders were probably the most robust of any large retrospective study of AKI that has been published, and the authors should be commended for this level of rigor. The whole purpose of the rigorous adjustments for multiple covariates is to try to minimize residual confounding and get as close as possible to the truth for the magnitude of association between the exposure (AKI) and the outcome (heart failure). Not only are statistical associations needed but also, biologic plausibility is necessary when trying to ascertain a potentially causal relationship from observational data. Indeed, the investigators provided the requisite potential mechanisms that may explain or contribute to CV events, including inflammatory cytokines, endothelial dysfunction, and alterations of mineral metabolism (1). These proposed mechanisms seem potentially novel and attractive, but they are simply underwhelming compared with classic knowledge of human physiology: the kidneys receive approximately 25% of cardiac output per minute; they are susceptible to changes in eGFR due to extreme depressions or elevations in systemic BP; they are sensitive to modulators of afferent and efferent arteriolar tone due to neurohormones, endotoxin, and various medications; and kidney function may be compromised in the setting of advanced liver or cardiac disease. In the vast majority of acutely ill hospitalized patients with AKI, it is often not difficult to find multiple different potential contributory insults. Most cases of hospitalized AKI, except from acute GN, do not happen spontaneously. To wit, as shown in table 1 in ref. 1, those with AKI had a greater burden of acute and chronic illness (consistent with every other observational study of patients with AKI versus patients without AKI). Given the imbalances in comorbidities and acute severity of illness, in an effort to minimize the imbalance in confounders, the investigators created a propensity score to match those with AKI with five patients without AKI. The c index for the propensity score was 0.82. As noted in the right-hand columns of table 1 in ref. 1, even after propensity matching, there were small numerical differences in the proportion of patients in the AKI group versus the non-AKI group with proteinuria, eGFR<45 ml/min per 1.73 m2, heart failure, ICU stay, and a predicted mortality >5%. For the continuous variables, patients with AKI had longer hospital stay and higher laboratory-based acute physiology score, even after matching (1). These seemingly minor differences in potential confounders/predictor variables for AKI are certainly factors that could have contributed to the very small absolute difference in risk for heart failure of 2% (5% in those with AKI and 3% in those without AKI) (1). From a simple top-down view, the 18% inaccuracy of the propensity score model could easily account for the 2% difference in heart failure. Although propensity scores can get closer to mimicking randomization, because some factor, insult, or trigger has to cause AKI, it is impossible to fully eliminate confounding from any observational study of AKI. The authors are careful to point out in their limitations that they could “not confirm a causal association,” but again, the hope is to study a potentially causal relationship; allusions are made in the discussion: “if the association is proven to be causal” and “additional research is needed…to determine whether prevention of AKI…improves outcomes” (1). What are the unintended consequences of making broad associations using epidemiologic data from large datasets without endophenotyping the type of AKI (i.e., prerenal/hemodynamic versus intrinsic/acute tubular necrosis or “biomarker-positive versus biomarker-negative AKI”)? Or, more specifically, what are the problems with data that imitate, in an abstract form, the Ptolemaic view of the universe, with the kidneys at the center of the body (i.e., solar system), and not the Copernican view (Figure 1), in which the path and orbit of the kidneys (earth) are largely determined by the gravitational forces of the other vital organs (i.e., the sun)? First, scientifically, a plethora of recent data has emerged that argues against the “AKI is causal, Ptolemic-view” of the universe. For example, although ischemia-reperfusion (I/R) injury has long been used as the model for AKI in experimental animals, including studies that show “distant organ effects,” the human kidney is remarkably tolerant to prolonged periods of I/R (2). It is well understood that I/R models of AKI do not recapitulate human AKI, yet this model still continues to dominate basic science experiments that may misguide our understanding of the pathophysiology of AKI in humans. Moreover, recently published data from Translational Research Investigating Biomarker Endpoints AKI (TRIBE-AKI) cohort showed that children (who generally lack the multiple comorbidities seen in hospitalized adults) who suffered AKI did not have lower GFR or increased incidence of CKD compared with those without AKI at 5 years after cardiac surgery (3). In adults who underwent cardiac surgery in the TRIBE-AKI cohort, AKI, as defined by changes in serum creatinine, was strongly associated with CV events or death over a median follow-up of 3.8 years. When we analyzed the relationship between five urinary kidney injury biomarkers and outcomes, however, the proportion of the association between these changes in creatinine and CV outcomes that was explained by five kidney injury biomarkers was zero (as opposed to 49% of the association explained by five cardiac biomarkers) (4). These recent data, although observational, support that the kidneys are the barometer and the “receiver” of insults that happen during acute illness. These data strongly suggest that the kidneys do not induce or cause CV events themselves. Second, given that there is no known established preventive or treatment strategy for AKI, it is difficult to find definitive evidence from randomized, controlled trials to prove or disprove the relationship between AKI and long-term outcomes. Perhaps the strongest dagger in the heart of the Ptolemaic supporters is the data from the CABG Off or On Pump Revascularization Study (CORONARY) Trial, in which off-pump cardiac surgery, arguably the most robust “anti-inflammatory, pro-renal perfusion” strategies that can exist, reduced the risk of any AKI compared with on-pump surgery by 17% and stage 2 or 3 AKI by 23%. Yet, at 1 year, there was no difference in eGFR or CKD (5). Moving forward, however, as we become more sophisticated and accept a Copernican, non-nephrocentric view of the universe, we should learn to embrace the concept of “permissive hypercreatininemia” in some clinical settings (just as intensivists have embraced permissive hypercapnia in the setting of Acute Respiratory Distress Syndrome) as long as the appropriate intervention for the patient is being administered. In the past 3 years, the author has served as a consultant for Janssen Pharmaceuticals for litigation related to SGLT2 inhibitor–associated AKI and as a consultant to CHF Solutions, Quark Biopharma, and Renalytix.AI.He is also a scientific co-founder and member of the Renalytix.AI Scientific Advisory Board (SAB). He also serves on the SAB for pulseData. The author thanks Ni-ka Ford, academic medical illustrator, for assistance with the figure enhancement. The author and his research are supported by National Institute of Diabetes and Digestive and Kidney Diseases grants R01DK096549, U01DK106962, U01DK082185 (Assessment and Serial Evaluation of the Subsequent Sequelae of AKI [ASSESS-AKI]), and R01DK112258 and in part by National Heart, Lung, and Blood Institute grant R01HL085757 (Translational Research Investigating Biomarker Endpoints AKI). The content of this article does not reflect the views or opinions of the American Society of Nephrology (ASN), or the Clinical Journal of the American Society of Nephrology (CJASN), or the ASSESS-AKI Consortium. Responsibility for the information and views expressed therein lies entirely with the author. See related article, “Acute Kidney Injury and Risk of Heart Failure and Atherosclerotic Events,” on pages 833–841.